*Items in backorders or preorders will be shipped automatically once we receive the item merchandise. If specifically requested to call before ship backorders and/or preorders, please add in the comments at checkout. Inspired by the sunny Southern California lifestyle, our fashion collections are dedicated to all women, with an emphasis on styles that appeal to every age. Each of our fashions has been carefully designed with a focus on enhancing the wearer`s individuality, but also bringing about a certain sense of well-being which can only be brought on through impeccable dressing. Enhancing life through fashion is our pleasure and our goal. 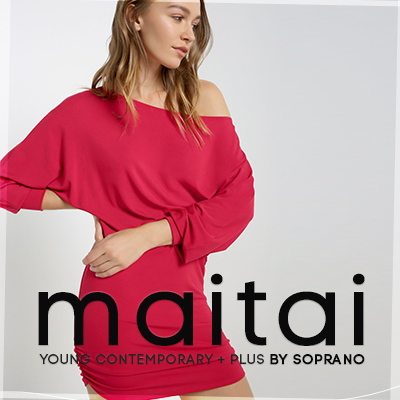 Each style we design for our exclusive Mai Tai clothing collection is proudly manufactured with quality and lasting beauty for every season as a foremost goal. Serving individuals and retail establishments alike, it is our joyful mission to provide women with beautiful fashions they are certain to enjoy wearing for all of life`s occasions. Contact us to express your specific needs, and we will happily provide you with personal service that reflects our desire to provide all the best things in life.